I just came off a five-hour flight yesterday, so my travel wardrobe has undoubtedly been at top of mind in recent days. In all honesty, comfort has not always been my priority when travelling, and it still isn't completely. I oftentimes place greater importance on what I need to be wearing for upon arrival than what makes the most sense for the actual journey there. But I have recently made progress in choosing airport outfits that are suitable for my destination but that won't leave me cursing my unfortunate wardrobe decision for the duration of the flight. After learning the hard way a few too many times, I finally decided to make a concerted effort to reform my travel wardrobe. And the first thing I ditched was one of the things I wear the most in life: high-waisted 100% cotton jeans. The no-stretch style is a favourite of mine for its vintage appeal and flattering fit. But when you're sitting upright in a confined space for hours on end and can barely bend over in them to pull your suitcase off of the baggage claim conveyor belt, let alone reach down to quickly remove your shoes when going through security, it's quite apparent that they're the worst denim style to wear on a flight. But all of this isn't to say that I've stopped wearing jeans on flights entirely. In fact, nine times out of 10, you'll find me in them when I travel. But it's the type of jeans I now opt for that's changed. I'll even still wear high-waisted styles, but only if they have some stretch in them. Trust me—even just 1 or 2% makes all the difference in the world. So if you want to learn from my unfortunate mistake(s) and stick to jeans that are comfortable enough to travel in, keep scrolling to shop three of my go-to travel outfits and 10 pairs of stretchy, comfortable jeans that won't do you wrong. 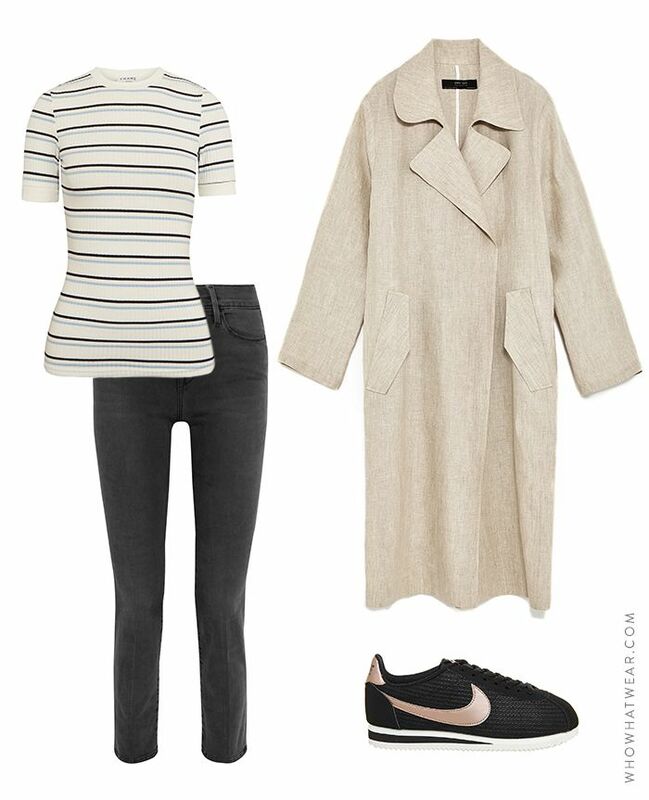 Pictured Above: Frame Striped Ribbed Stretch T-Shirt (£120); Zara Linen Trench Coat (£70); Nike Cortez Leather Lux Sneakers (£55); Frame Le High Straight Jeans (£240). Pictured Above: Madewell Textured-Leather Biker Jacket (£605); Frame Le High Straight Jeans (£240); Stuart Weitzman Mulearky Slides (£360); Coach Embellished Space T-Shirt (£145). Pictured Above: Comme des Garçons Play Sweatshirt in Ivory (£183); Frame Le High Straight Jeans (£240); Gucci Brixton Convertible Loafers (£525); H&M Satin Cap (£3). Hate flying in anything tight? Meet your new favourite travel jeans. This super-stretchy style is a celebrity favourite. This is the pair I chose for my most recent flight and it was a success. I'm wearing this cotton-poly-elastane pair for my flight home. Cropped flares have become a classic denim style, in my opinion. If you don't love high-rise styles, I can say from personal experience that this pair is gold. This vintage-inspired style looks far more expensive than it is. Embroidery is the perfect way to update your denim collection for summer. These have the perfect amount of subtle distressing. If you're brave enough to travel in white jeans, this pair will at least ensure that you're comfortable. Next up, we've rounded up the best of the summer sales for you.